Maybe we need to see a “meet the contestants” post. …That would have been a great idea! So we have Esmeralda on the pyre spitting at Frollo, Frollo doing a spit take when Quasi says “Festival,” Hugo spitting out feathers, Hugo ABOUT to hock a loogie on a mime, and Hugo spitting out rocks like a machine gun. Just how much spitting is in this movie? 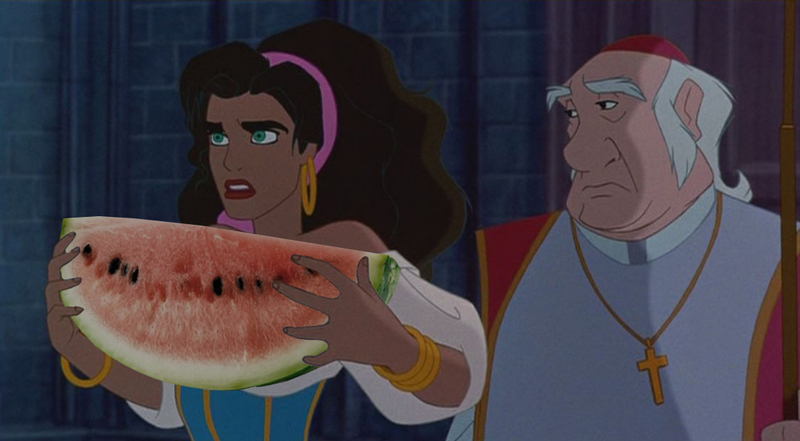 XD I was honestly expecting a picture of her at the pyre spitting watermelon seeds at Frollo.